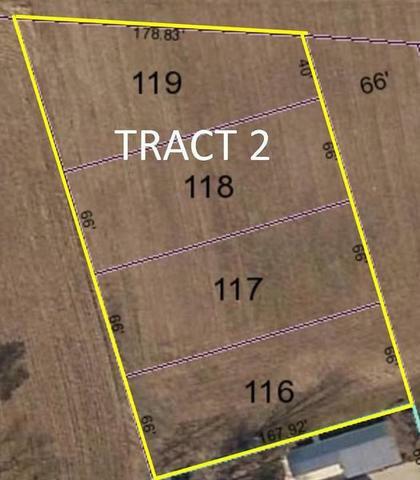 Longtime owner is selling a very productive parcel of farm ground with 2 barns and lots of prime development possibilities with sewer available. For viewing please call office for an appointment. Don’t Miss It!! TRACT #1: Buying (4) combined lots known as auditor parcels 39010000-2000, 2100, 2300 & 2400, located on Marion St. with 92+/- ft. frontage, totaling 1.5+/- acres. Improvements include nice 1991 Morton 40’ x 80’ pole barn with concrete, elect., heat, office, shop area, vintage 1920’s 42’ x 26’ barn w/hayloft, hand hewn beams, additional rear frontage on undeveloped Center St. Taxes are $751.68 per year. TRACT #2: Buying (4) combined lots known as auditor parcels 39010000-5900, 6000, 6100 & 6200, located at dead end of Center St. with 337 ft. total frontage on undeveloped portion of Center St. totaling .97+/- acres. Currently all lots are being used as tillable farmed acres with sewer taps available. Taxes are $23.98 per year. TRACT #3: 53.73+/- acres (parcel 390020000-500) with 177+/- total ft. frontage on Marion St. (SR 423) mostly tillable acres with 7.4+/- rear wooded acres. Pewano, Blount, Glynwood soils. Taxes are $2,004.22 per year. TERMS & CONDITIONS:The successful bidder(s) will be required to enter into a purchase contract at the conclusion of the auction. A deposit (non-refundable) for Tract 1 & 2 will each require $3,000 down, Tract 3 will require $15,000 down or $20,000 as a whole shall be due at the conclusion of the auction with the balance due in 45 days. Your bidding is not conditional upon financing, inspections or appraisals. Be sure you have arranged financing, if needed, and are capable of paying certified funds at closing. Assignments of any purchase contracts are conditional on the bidder remaining jointly liable on the contract with the assignee. Taxes pro-rated to closing date. Tracts selling subject to all legal highways, easements, restrictions, agreements and right-of-ways of record, and any lease, grant, exception, or reservation of coal, oil, gas and other mineral rights and interests previously transferred or reserved of record, if any. Farmland is under CAUV. If buyer changes usage, any recoupment will be at the buyer’s expense. New survey will be paid by sellers if needed. The purchaser will be responsible for the cost of title insurance or other type of title evidence if the purchaser(s) elect to acquire such title insurance/title evidence. Tract 1 & 3 subject to ingress/egress easement for benefit of field access and benefit to buyer of buildings. Acreage and frontage are subject to final survey if applicable. BIDDER NOTICE: We will be using the multi parcel auction method. 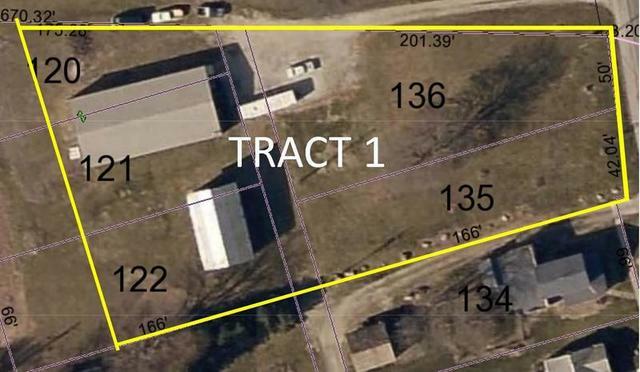 Tracts 1 thru 3 to be offered individually in combination or as a whole 57+/- acre farm. Selling in the manner that brings the most money. All bids will compete and remain open for bid advancement until auctioneer announces property sold. DISCLAIMER: Information contained in this brochure and all related materials is based upon information available at time of listing and are believed to be accurate, but is subject to verifications by all parties relying on it. No liability for its accuracy, errors or omissions is assumed by the sellers or Auction Company. Tract acreage, dimensions, aerial photos and boundaries are approx and are taken from Co. & FSA Agency records. The potential Buyers hereby stipulate and agree that they have examined the property. Relying solely upon such examination with reference to conditions, Buyers agree to take such property “AS IS” without any expressed or implied warranties by Seller or Seller’s agent. Any inspections desired by the Buyer shall be prior to the auction at Buyer’s expense.